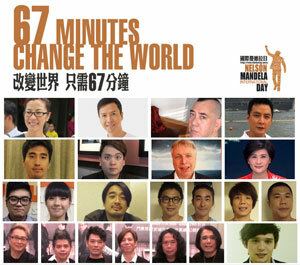 Mandela Day Asia — www.mandeladay.asia — brings the Mandela Day Campaign to Asia. The Mandela Day campaign message is simple: Mr Mandela gave 67 years of his life fighting for the rights of humanity. All we are asking is that everyone gives 67 minutes of their time, whether it’s supporting your chosen charity or by serving your local community. Whether as an individual, community, business, non-governmental organisation (NGO) or a government department, all you have to do on July 18 is donate 67 minutes of your day to doing something good in any way you can. Nelson Mandela gave 67 years of his life to the struggle for social justice. Can you spare 67 minutes of yours to support a charity or serve your local community?